A stop at the Company Store is a great conclusion to your museum visit. Our Logging Museum T-shirts and polo shirts wear especially well and make excellent gifts. You can support the Shay’s restoration by buying and proudly wearing a Yosemite Lumber Company T-shirt with its full-color painting of Shay No. 4 in the woods. Our shelves are full of books about logging and logging railroads, and handcrafted wooden toys will entertain the youngest in your family. Best of all, we have a broad selection of lithographed prints by Patrick Karnahan whose paintings emphasize the forests, from logging railroads to the brave souls battling forest fires. You’ll always find something new in the Logging Museum’s Company Store. Patrick Karnahan’s Train Prints Now on Sale! Great News! Patrick’s Prints now on Special Sale Reduced by 1/3 rd. !!!!! Long time museum supporter and prime mover in getting our Shay Locomotive to the museum, Patrick Karnahan is now having his train paintings seen on a daily basis by perhaps a half million calendar readers. Orchard Supply Hardware, OSH, selected Patrick’s paintings for each month of their 2008 calendar. The museum has a quantity of very high quality prints of Patrick’s train paintings. They are available now on special sale for $40 and we are ready to mail them to buyers. All proceeds go toward the restoration of our Shay Locomotive. 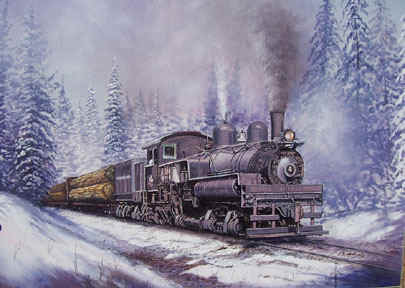 This is a sample of one of his paintings: Patrick’s Winter Portrait of YLCo Shay No.4 bringing in the last load of the season. Patrick also has a Summer Portrait of the Shay at work. In addition to these two Shay prints, we have a number of other prints of his that sell normally for $40. They include a magnificent print of a Borate Bomber making a drop on a fire. That print is this editor’s favorite. We are splitting the proceeds from these prints with Patrick. Email us or call the museum (leave a call back number if no answer) to buy this print, or one of our other great prints by Patrick. Do you carry or can get a copy of Jim Olsen’s Clover Valley camps book? Hi Nora, No, but I believe you can get a copy through the Plumas County Museum. Thanks for asking. the ’08 calendar? And the price for each? Thanks very much. Do you have a Patrick Karnahan print of the Westside Lumber #9 at the camp 8 water tower, titled “In the Woods at Eight”? If so, what is the price, and how would I get one? I think we might Greg, let me check the next time I work at the museum. We did have, so I’ll have to see if it sold. If you don’t hear from me, ask me again. Hi, just hound the website while researching detailing for a logging shay model. could you tell me the size of the winter print and do you ship to NJ? can you attach a picture of the t-shirt and price, please? The museum is closed for the winter and except for checking on the building occasionally, no one is there because of the snow. I’m in the desert for the winter. Bottom line: If you’ll contact me after the first of May, I’ll get the photos and info out to you. Or, you can try the museum by phone after the first of April, and maybe one of our docents can help you then. When I’m not there, we’re really short of technology capability. Can you provide the name and telephone or email contact for the artist who did your logging museum poster used at the top of your website? I have been trying to get a copy of the episode of Huell Howser’s visit to the Lumber Mill at Pino Grande. I am wondering if your store offers it. Any information I can get on that video would be greatly appreciated. I didn’t know Huell did a video on Pino Grande, so obviously we don’t have a copy. However, Catenary Video Productions has one entitled Pino Grande, and although we don’t have that one, we have others and they tend to be very well done.